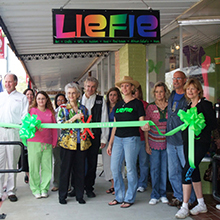 Liefie Li Vine originally launched in March 2010 as a craft vendor mall in historic downtown Winnsboro, Texas. Within a year, owners Jackie and Phillip Strydom were convinced the addition of South African foods, ambience and vibrancy would contribute to the quaint, East Texas town’s unique shopping, dining, and cultural events. After failing to acquire the necessary funds for expansion through conventional means, a supportive angel investor provided interest-free financing to help the South African immigrants realize their dream. Designing their own restaurant was a struggle, drawing sweat, tears, and a little blood at times. Phillip, a master residential craftsman, built the restaurant with Jackie’s help. He discovered that building a restaurant was quite different from building a home. After construction the kitchen was found to be too small. Appliances had to be repositioned and other changes implemented for efficient process flow. In May 2011 the Strydoms’ restaurant dream became reality including a chef’s kitchen and enclosed patio for outdoor dining and live entertainment. The initial plan was to serve South African style sandwiches along with award-winning Texas wines. Early customer response was so overwhelming that Jackie and Phillip launched a second expansion later that same year. Today, Liefie Li Vine is known throughout much of Texas, Oklahoma, and Louisiana. From its meager beginnings as a craft mall turned sandwich shop, the restaurant now offers flat-iron steaks, seafood, soups, sandwiches, exotic salads, and outstanding Texas wines. On Friday and Saturday nights accomplished singers and songwriters entertain diners on the patio with a variety of musical talent. In February 2014, Leifie’s, which means “Sweetheart” in Afrikaan, won Best Restaurant designation in the annual “Best of Upper East Texas” contest, sponsored by County Line Magazine. Phillip Strydom was named Runner-up in the Best Chef category, second to a 3-year Hall of Fame Best Restaurant chef.